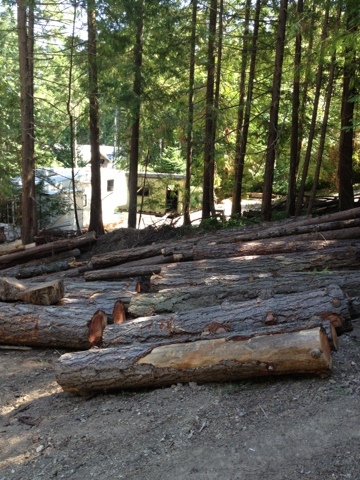 One of the hardest things to accept when you plan to build a new home on a forested lot is the trees must be cut down. It has to happen but for someone like me it was a very painful decision. I arrived at my lot from the ferry just after the first trees had been cut down . The devastation seemed enormous. We had been very selective with which trees to cut down but it still seemed like a lot of trees lay on the ground. My neighbour, Evan, had the big machine needed to move the trees. He took off the branches and cut them up into lengths and placed them carefully, ready for milling. It was my original intention to use all the wood from my Douglas firs and cedars in my cob house. Another friend, Lou, has a chain saw mill which he kindly brought down from Hot Springs Cove. I had arranged to meet him last Wednesday in order to plan cutting up the wood. He needed the wood to be laid out across two supporting logs so they could be rolled off easily in order to mill them.. This had yet to be done. We sat down with the house plans to determine how much wood we needed and what dimensions the wood needed to be. For my house we need posts that will go upright in the walls. There are also posts that would support the beams which go across to support the ceilings and upper floors. There are two by sixes and two by fours for the floor joists and the rafters and the framing of the upstairs floor. Lots of different dimensions. It took us an hour and a half to do most of the figuring. By this time we were thinking that this was a lot for a chainsaw mill. So I started seeking an alternative. I called my friend Carol who knows all the local tradesmen and she gave me a name. And I emailed Patrick Heneberry to ask his advice, first of all for someone who had a mill on the island, and secondly if it was even worth the cost of milling the wood. Patrick immediately said the Douglas fir would be cheaper to buy but the Cedar would be worth milling for the siding. When Richard Brown came around to look at the logs to see if he was even interested in taking the job on, he said that the Douglas fir logs were too big for him to work with and also there were a lot of large knots in them, as well as sap. He told me that Mayne island Douglas fir turned very hard once felled. He felt we might be having to resort to screwing the wood rather than just hammering nails. So, at the moment is Plan B. Lou and I will select and mark the smaller round Douglas fir that will be suitable for the posts and the beams and the round rafters which I would like to see exposed in the lofted ceiling. Richard will mill the cedar for the bat and board siding. And hopefully I have a contact for someone to come and take the fir for firewood. I will begin my search for some recycled wood for my floorboards upstairs and who knows I might even find wood I can use for my framing. Otherwise it's off to the builders merchants.